Only twenty-nine new Lithuania stamps were actually issued during this two year period, a new set of pictorial definitive postage stamps and one new set of commemorative postage stamps. The big news of 1921-1922 was the change-over to a new currency in Lithuania. The Auksinas (1 Auksinas = 100 Skatiku) was replaced by the Litas (1 Litas = 100 Centai) during 1922. This event required that existing inventories of every Lithuania postage stamp issued since 1919 be re-valued in the new Litas currency! 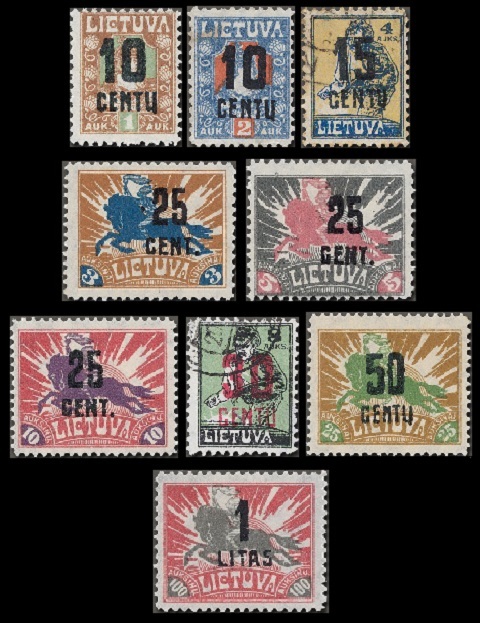 The seventeen pictorial definitive Lithuania stamps shown above were issued in 1921 and 1922. The stamps are lithographed on paper that is watermarked webbing, and they are perforated 11, 11 1/2, or compound. The common designs, as they appear in the set, are as follows. Grand Duke Kestutis (1297-1382), was the son of Grand Duke Gediminas (1275-1341). He ruled the Grand Duchy of Lithuania, along with his brother, from 1342 to 1382. He was the first Lithuanian ruler to (officially) convert to Christianity. Horseman carrying the Torch of Freedom. The Scott catalog attributes for these definitive postage stamps are as follows. 010 S. (1921 - Sc. #97) - Bright Rose. 015 S. (1921 - Sc. #98) - Violet. 020 S. (1921 - Sc. #99) - Ultramarine. 030 S. (1921 - Sc. #100) - Brown. 040 S. (1921 - Sc. #101) - Red. 050 S. (1921 - Sc. #102) - Olive. 060 S. (1921 - Sc. #103) - Green & Violet. 080 S. (1921 - Sc. #104) - Brown Orange & Carmine. 001 A. (1921 - Sc. #105) - Brown & Green. 002 A. (1921 - Sc. #106) - Gray Blue & Red. 003 A. (1921 - Sc. #107) - Yellow Brown & Dark Blue. 004 A. (1922 - Sc. #108) - Yellow & Dark Blue. 005 A. (1921 - Sc. #109) - Gray Black & Rose. 008 A. (1922 - Sc. #110) - Green & Black. 010 A. (1921 - Sc. #111) - Rose & Violet. 025 A. (1921 - Sc. #112) - Bister Brown & Green. 100 A. (1921 - Sc. #113) - Dull Red & Gray Black. Many of these definitive postage stamps exist in imperforate pairs. They are common. 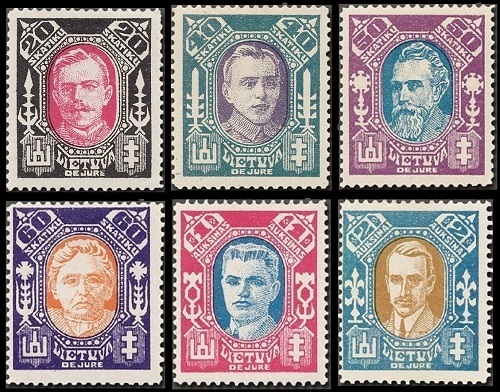 The twelve commemorative Lithuania stamps shown above were issued on September 27, 1922 to celebrate the Recognition of Lithuania by the League of Nations. 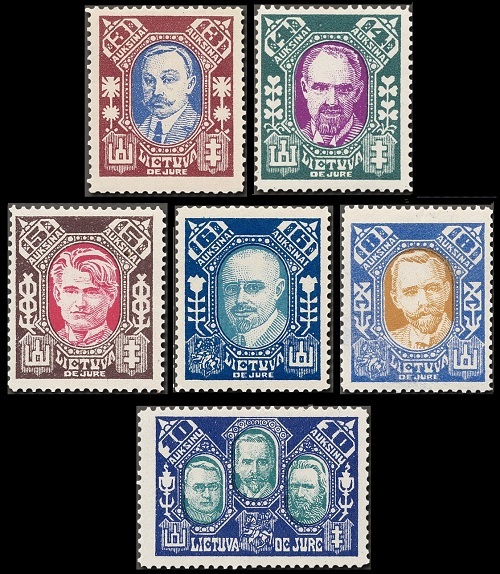 These stamps, featuring portraits of prominent Lithuanians, were only sold at post offices on October 1, 1922. The catalog attributes and descriptions are as follows. 20 S. (Sc. #116) - Povilas Luksis (1886-1919). 40 S. (Sc. #116A) - Antanas Juozapavicius (1894-1919). 50 S. (Sc. #116B) - Jonas Basanavicius (1851-1927). 60 S. (Sc. #117) - Gabriele Petkevicaite-Bite (1861-1943). 01 A. (Sc. #117A) - Augustinas Voldemaras (1883-1942). 02 A. (Sc. #117B) - Pranas Dovydaitis (1886-1942). 03 A. (Sc. #118) - Mykolas Slezevicius (1882-1939). 04 A. (Sc. #118A) - Ernestas Galvanauskas (1882-1967). 05 A. (Sc. #118B) - Kazys Grinius (1866-1950). 06 A. (Sc. #119) - Aleksandras Stulginskis (1885-1969). 08 A. (Sc. #119B) - Antanas Smetona (1874-1944). 10 A. (Sc. #119C) - Justinas Staugaitis (1866-1943), Antanas Smetona (1874-1944), and Stasys Silingas (1885-1962). Some sheets of the 08 A. denomination stamps erroneously contained the portrait used for the 06 A. denomination stamps (Sc. #119a). Examples of these errors are very scarce. During 1922, all of the existing postage stamps of 1919-1922 were overprinted and re-valued in the new Litas currency. The overprints are in black, carmine, or green. I am going to try and make this section as simple as possible. ALL of the overprints listed in the Scott Standard Postage Stamp Catalogue are shown in the images, and they appear in the order that they are listed in the catalog. 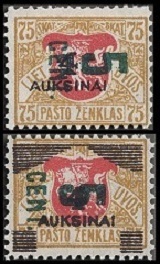 The three overprinted and re-valued Lithuania stamps shown in the image above are from the grayish granite paper printing of 1919. The stamps in the other images are all from the white paper printings. 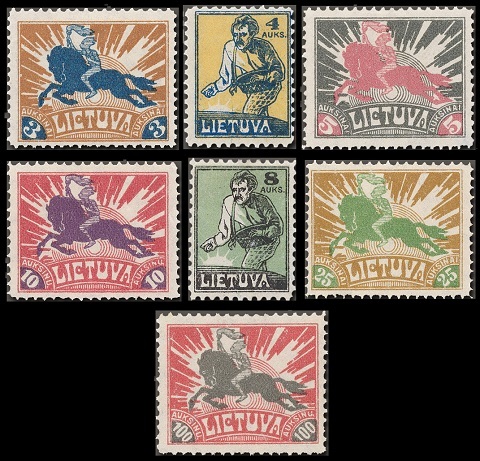 The catalog attributes of the three overprinted and re-valued Lithuania stamps shown above are as follows. 03 C. on 01 A. (Sc. #120) - Gray & Rose. 03 C. on 03 A. (Sc. #121) - Bister Brown & Rose. 03 C. on 05 A. (Sc. #122) - Blue Green & Rose. 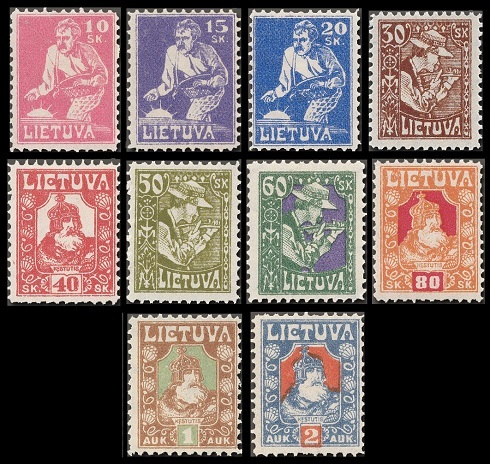 The Scott catalog attributes of the overprinted and re-valued Lithuania stamps shown above (1919 printings) are as follows. 01 C. on 10 S. (Sc. #123) - Red. 01 C. on 50 S. (Sc. #124) - Lilac. 01 C. on 20 S. (Sc. #125) - Dull Blue. 01 C. on 30 S. (Sc. #126) - Orange. The validity of this stamp, in the orange shade, has been the subject of much debate in the past. Most of the examples that have appeared in the philatelic marketplace have been identified as being forgeries. Authentic examples are very rare. The example shown in the image above, cropped from a certified large multiple, is authentic. 01 C. on 30 S. (Sc. #127) - Buff. 01 C. on 40 S. (Sc. #128) - Gray Brown. 02 C. on 50 S. (Sc. #129) - Green. 02 C. on 60 S. (Sc. #130) - Violet & Red. 02 C. on 75 S. (Sc. #131) - Bister & Red. 03 C. on 01 A. (Sc. #132) - Gray & Red. 03 C. on 03 A. (Sc. #133) - Brown & Red. 03 C. on 05 A. (Sc. #134) - Blue Green & Red. 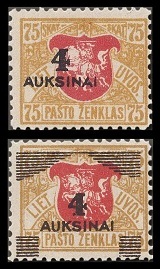 The Scott catalog attributes of the overprinted and re-valued Lithuania stamps shown above (1920 printing) are as follows. 01 C. on 20 S. (Sc. #136 - Unwatermarked) - Deep Blue. 01 C. on 20 S. (Sc. #138 - Watermarked) - Deep Blue. 01 C. on 40 S. (Sc. #139) - Gray Brown. 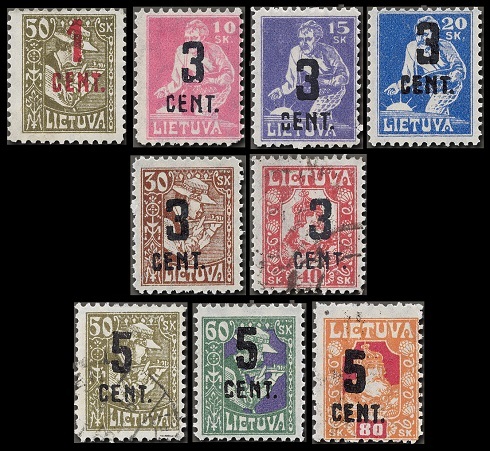 The Scott catalog attributes of the overprinted and re-valued Lithuania stamps shown above (1921-1922 printings) are as follows. 01 C. on 50 S. (Sc. #140) - Olive. 03 C. on 10 S. (Sc. #141) - Bright Rose. 03 C. on 15 S. (Sc. #142) - Violet. 03 C. on 20 S. (Sc. #143) - Ultramarine. 03 C. on 30 S. (Sc. #144) - Brown. 03 C. on 40 S. (Sc. #145) - Red. 05 C. on 50 S. (Sc. #146) - Olive. 05 C. on 60 S. (Sc. #147) - Green & Violet. 05 C. on 80 S. (Sc. #148) - Brown Orange & Carmine. 10 C. on 01 A. (Sc. #151) - Brown & Green. 10 C. on 02 A. (Sc. #152) - Gray Blue & Red. 15 C. on 04 A. (Sc. #153) - Yellow & Dark Blue. 25 C. on 03 A. (Sc. #154) - Yellow Brown & Dark Blue. 25 C. on 05 A. (Sc. #155) - Gray Black & Rose. 25 C. on 10 A. (Sc. #156) - Rose & Violet. 30 C. on 08 A. (Sc. #157) - Green & Black. 50 C. on 25 A. (Sc. #158) - Bister Brown & Green. 01 L. on 100 A. (Sc. #160) - Dull Red & Gray Black. 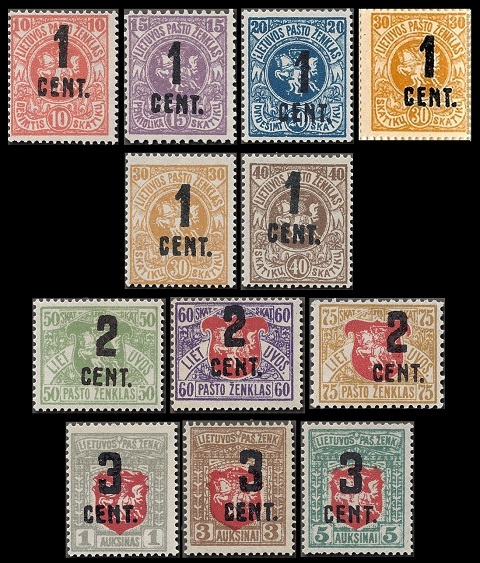 The two provisionally re-valued 75 C. denomination definitive stamps of 1919 shown above (Sc. #114-115) were issued as 4 A. denomination stamps in May 1922. The two re-valued provisional definitive stamps of May 1922 shown above (Sc. #149-150) were issued as 05 C. denomination stamps, during the conversion to the new Litas currency, later in 1922.